In 1839, Nathaniel Leonard of Ravenswood Farm in Cooper County, Mo brought the first purebred or blooded cattle into Missouri. Mr. Leonard's Shorthorns were a pure white bull named Comet Star and a colored heifer. He paid $1100.00 for the pair. Nathaniel's brother, Benjamin, bought this pair from Mr.George Renick of Ohio. The cattle were considered so valuable that they were sent via river boat from Ohio with two attendants. From this pair many shorthorn cattle were produced and shown at the early fairs in Missouri. 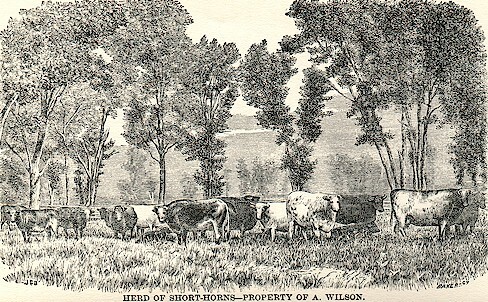 Durhams along with Angus, Galloway, and Hereford became the major breeds in Missouri. Durhams gained popularity in many other counties in Missouri. Durham's are considered to be much like the Shorthorn cattle we have today. Some farmers did not like the new Durham cattle because they required much more attention and feed. Some believed that the Durham crossed with the native cattle made for some very good stock. Wintering the cattle was a major problem. Most of the cattle would go through winter without any feed and as soon as spring rolled around the cattle would be in poor condition. After the Civil War, the cattle business really exploded. In 1882-1883 the Leonard Brothers brought about 1,000 of Galloway cattle to Missouri. In 1882 the Galloway Breeders Association was established.The Galloway held the spotlight for a short period of time. 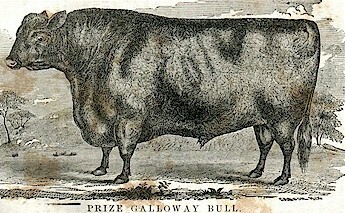 When the Aberdeen Angus gained popularity, the Galloway popularity suffered. In 1881 the first Angus cattle were brought into Missouri by the firm of Gudgell and Simpson. By 1882 they were working on bringing their second crop of Angus cattle to Missouri. They moved all of their cattle from Pleasant Hill to Independence, Missouri in 1883.